Moss Agate is a bit of a misnomer as it neither has moss in it and also is not, in some cases, agate. Much of the material called Moss Agate is of the silicate family that has green dendritic inclusions that 'grew' within. Dendrite is Greek for tree and represents, in this case, the minerals that grow like plants as opposed to a crystal structure (like copper and silver if you have seen them raw). Such a mineral is growing inside the 'silicate soup' before it solidifies and the oxidation or valence of the mineral reflects the color of the 'moss'. For minerals turning all the other colors of the rainbow than green, dendritic agate is a more suitable term. Moss agate can appear in many shades of green in clear, milky, or tinted agates. 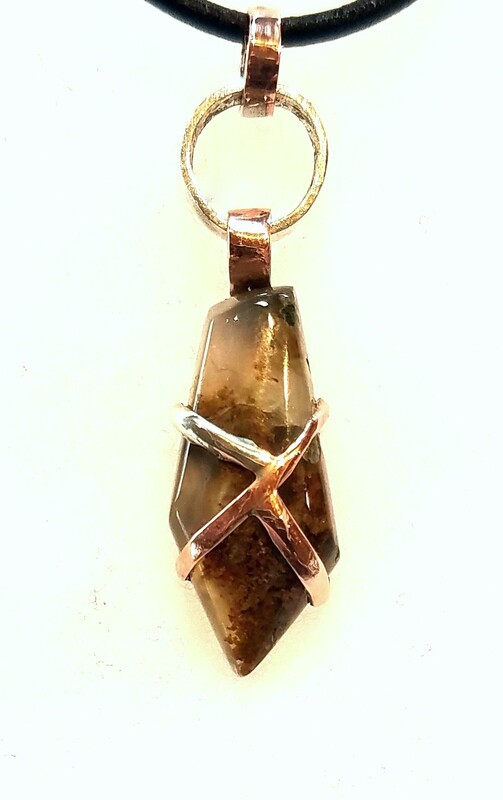 This piece has rich olive colored moss like pond algae and true agate banding in the center with a quartz druzy seam. The mermaid’s view through the curling kelp forest might be the vision of this stone. Dark Green and Brown moss bends through clear agate like the kelp bed dancing in the current. The lower stone is a 5mm Moss Agate ‘dot’ that has delicate filaments shooting through it. Moss Agate can be an incredible microcosm mimicking, at times, the very location that it came from. 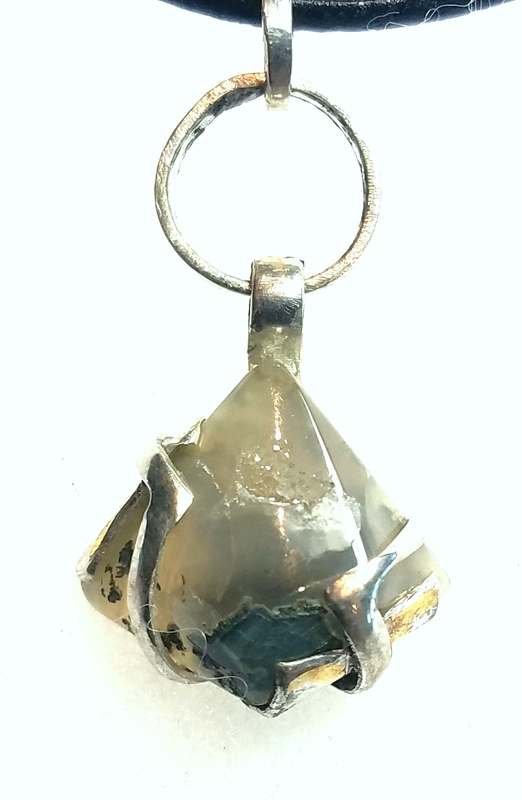 This piece has dark mossy inclusions, deep watery blue tinted agate, and quartz druzy at the top like a mountain or underwater scene. Often the dendritic agate that I've worked with has creeping fronds of yellow ochre, oranges, reds, and even purple like Autumn leaves. The attendant agate around these inclusions often is a warm color of amber or pink leading to a lovely Fall like presentation.